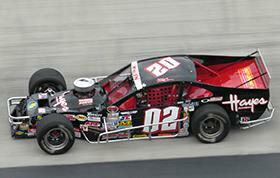 2014 could be a record-setting year for veteran Modified racer Tim Brown. With just two more wins, the Cana, Virginia native will assume the title of the all-time wins list leader at historic Bowman Gray Stadium in Winston-Salem, North Carolina. Brown has been winning at "The Stadium" for more than a decade. He's won seven NASCAR Whelen Southern Modified Tour races and has finished in the top five in more than half of the races he has competed in . As the seasons go by in Southern Modified racing, one thing that doesn't change is Tim Brown's car up front. It would be a safe assumption that things wouldn't change much for Brown in 2014. The 42-year-old Brown will still go for his record 10th NASCAR Whelen All-American Series Modified track championship at Bowman Gray, as well as the all-time wins mark, when the season begins in April. The change has come on the touring side of Brown's career. Brown has been a no-show in the NASCAR Whelen Southern Modified Tour's first two events of the season. Instead of chasing more NASCAR Tour wins this season, Brown's Tour car owners Tom and Connie Lythgoe have made the decision to compete in the upstart KOMA Unwind Modified Madness Series in 2014. When the first KOMA Modified green flag falls this Saturday at Hickory Motor Speedway in North Carolina, it will mark the first major change in Brown's on-track career since he parked his own Tour team to join the Lythgoes' T&C Motorsports team in 2010. "It's something different and something new," said Brown. "We supported the Tour for so long and my car owners didn't feel like they were getting anything out of it. The cost of tires go up, the fuel goes and yet we are racing for the same money each week. Now we are going to support the KOMA Series in 2014." The driver who now calls North Carolina home is not out to point the finger at NASCAR. But, Brown as Brown noted, with the cost of racing on the rise and the standard $2,000 winner's purse remaining the same as it was when the Tour ran their first race back in 2005, the KOMA Tour and it's $2,900 winner's checks offers drivers a chance for more pay per event. "Brian Webber has done a great job in putting this KOMA Modified deal together where we can go run shorter races on a cheaper tire and race for more money. It's pretty much a no brainer," added Brown. "It's a tour that anybody with a Modified can go run. The NASCAR tour has priced it to the fact that you have to be a well funded team to go run there. I think this will help (Bowman Gray) Stadium guys come out and get their feet wet. Ace (Speedway in Altamahaw, NC) guys too. It's not meant to take away from NASCAR, but just to make another place to race." Brown stated that on one trip to the Atlanta Motor Speedway (GA) NASCAR Whelen Southern Modified Tour race in 2010, he spent $4,000 to tow to a race and made back just half of that by finishing second. That decision led to him driving for a car owner and ultimately switching to the new series. "Weber is financing this thing himself," added Brown. "Brian is a racer and he understands that if you don't take care of the racer then you won't have a thriving tour. What he pays to start these things can pretty much cover your tire bill." The first race at Hickory is scheduled to pay $2900 to the winner and $475 to start. "We get to go to some different venues and that is exciting," added Brown. "We'll be at Hickory and at Ace and those places I really like to race at - places that we have not gotten to see much with the NASCAR tour." Brown also looks at the Northern tour as something that should mirror it's southern counterpart. "I am biased to the point that I don't think that the Southern Modified tour guys ever got the same play that the Northern Modified Tour guys have," explained Brown. "We run the same tires, the same number of laps and they are running for way more money to win. We just have an opportunity to race for more money." Brown is not done with the NASCAR Southern Modified Tour. His schedule might actually be his busiest yet. Several teams have contacted him about running their car this year and he is still working out the details with no restrictions coming from the Lythgoe family. He could end up running more than 40 times this year between the two Tours and the Stadium. Either way, Hayes Jewelers will be on the No. 02 tour Modified and No. 83 at Bowman Gray for another season as they chase two championships as a force. "When I drive from work at Michael Waltrip Racing to my shop I have an hour and half where I think and try to cross all the T's and I's on what I can do better," added Brown "To think I am two wins away from holding all the records at the Stadium. that's awesome to think about." Known as "The Rocket," Brown is still eyeing that regional touring title that he's missed in three consecutive years by a total of 61 points from 2006 to 2008. If he gets it this year, plus earns his two wins at the Stadium, then it will be year to remember. Coughlin and Team JEGS look to get to victory lane with the ARCA Racing Series in 2014.